I do a lot of bike rides, some of them very long. And in a lot of cases I write a story of them for my blog. I’ll probably write a blog account of this particular ride too. It’ll include all the usual details of the route we rode, the bikes and equipment we chose, the friends we rode with and the many events which took place along the way. Sometimes though, one moment from the many hours along the road stands out from all the others. Occasionally it’s something funny, sometimes spiritual, but more often it’s the human moments which touch you the most. This story is about one such moment from last weekend’s ride – something truly unique, and totally unexpected. 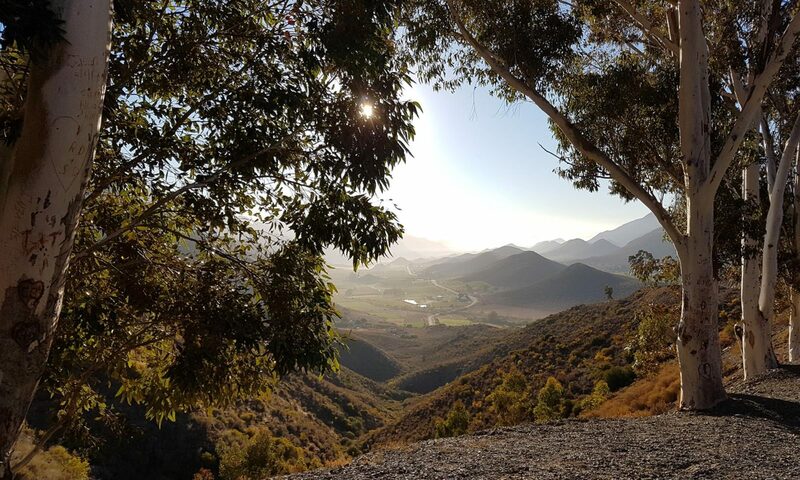 My riding companion, Theunis, and I rolled into the quaint Boland Town of Robertson at 7pm on Saturday 18th March – exactly 24 hours, and 428km since we had left the equally quaint town of Stellenbosch. That might not sound like far, but we had travelled all of it by bicycle. We’d ridden down the coast through the night, arriving at daybreak at the southernmost tip of Africa (L’Aghulas), before turning back inland to cross the relentlessly undulating, leg-sapping farmland of the Overberg. We’d perhaps had 4 hours in total off the bikes in that period. In short, we were knackered – and generally quite smelly too. We were badly in need of some sleep to stand any chance of completing our ride by the 11am cutoff the next day. But the luck we had ridden all day in terms of wind direction ran out when it came to finding accommodation. Whether the B&Bs were genuinely all full – or whether our appearance and odour were too rank we’ll never know. But having visited pretty much every guesthouse in town, Theunis and I were left standing on a street corner debating whether the benches in Wimpy or Steers would be more comfortable, and which one was likely to chuck us out first. We didn’t get to find out though – because luck swung our way again with a message and phone call from our friend Nico. Not ten minutes later we were stood outside a building a few streets away phoning Nico’s Aunt, Marleine, who just happened to live and work in Robertson and had offered to help. As random and spontaneously generous as this all was, that isn’t the remarkable part. The building we were standing outside was an orphanage – or a more accurate description would be children’s home, although its original founding was as an orphanage. The electric gates opened, and we were quickly led from the street by Marleine. One small remaining barrier stood between us and the much needed rest – a spiral staircase. Clearly no issue for us, but no way our heavily loaded bicycles would get up there – even with the willing help of one of the strong teenage lads, that was immediately offered. There was nothing for it, we’d need to leave them propped against the wall in the yard outside. It’s hard to describe how attached you become to a bike after so many hours, especially with so much work and effort invested, and it being your only means of getting home the next day too. But there was no hint of wavering in the assurance from Marleine that they’d be safe there. Somehow, rather oddly for someone as naturally cautious as me, that seemed more than enough. We grabbed the gear we needed, trudged upstairs, and were shown a room – with actual beds – two of them – and comfortable looking ones at that. We seriously needed nothing more – but more was what we got. Towels and soap arrived and, although Nico had remarked that the showers were communal, they may as well have been private because we had them to ourselves. Not before a small price was required for our stay though. Theunis was asked to give a short talk to the group of twelve or so teenage boys sat on couches in the lounge. I guess it’s not every day random cyclists turn up in the evening, shower and sleep for a couple of hours, and then leave again in the middle of the night. In the time I’ve lived in South Africa my Afrikaans has improved to the extent I can follow most conversations, and one thing I’ve noticed in the process is how poetic the language can sound when spoken with true heart. I understood pretty much all of the words Theunis spoke, but the thing which struck a chord was the passion with which he delivered them. Looking into the faces directed towards him I’m sure more than a little inspiration was passed on to this next generation. Impressive really, since behind Theunis sat the TV who’s programme our arrival had interrupted. Our remarkable evening didn’t quite end there though. As we showered and got ready to sleep, one of the lads made us piles of delicious toasted sandwiches. And when we couldn’t quite finish them all, the leftovers were wrapped in foil so we’d have something for the road the next morning. Sleep wasn’t exactly slow to come. Theunis was “uit soos n kers” (out like a light). I took maybe a minute or two longer – still slightly stressed at my steed standing outside all alone, and half an ear listening for it wheeling away. But pretty quickly sleep took hold, and the next thing I heard was the alarm going off at 23:45. The home was still and quiet, but Marleine was up, sat in the kitchen writing the daily report on each of her charges. As we readied to leave she explained how it had taken a while to build up rapport and earn trust, but it was clear to see the remarkable job she was doing with all of them. Everything we saw created the impression of fine, respectful young men in the making. And yes, of course, as promised our bikes were safe and sound waiting for us outside. As we kitted up we tried to offer something for our stay, but it was declined. All we were able to leave behind for the help which had quite literally saved our ride was our thanks, and maybe a good story about the two mad old gits who arrived in the middle of the night on bicycles. So often with these moments, the real truth of them only actually strikes you later. For me, it was around 3:30am at our next stop along the road. I was polishing off the remaining leftover toastie when it hit me. The tasty sandwich I was eating had been made for me by one of a group of boys who most likely came from backgrounds where they had very little. We’d rolled up and parked our flashy bikes in their yard, been offered beds and welcomed into their home. And we’d been asked nothing for it. In that moment, outside a garage in the small hours of the morning, sat on a pile of charcoal sacks, I suddenly felt rather humbled.